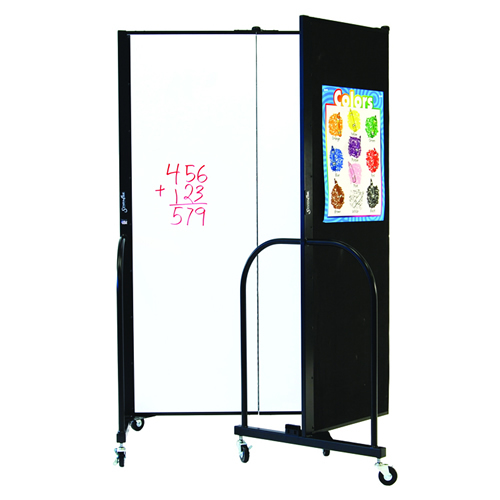 The wet erase/tackable divider is the perfect choice for consumers who seek versatility and functionality. These noice absorbing, accordian-style partitions provide division and seperation in schools, churches, corporations, hospitality and government settings. Use wet erase markers on the birght white, writable, east to clean surface to create an interactive environment or to enhance any collaborative workspace. On the opposite side of the divider, charcoal black fabric covers a 3/4-inch closed cell honeycomb core for sound absorption Furthermore, this unique design provides a tackable display surface.